Beautiful apartment, 2 bedrooms, 2 bathrooms, pool, air con. Lovely 1st floor, 2 bedroom, 2 bathroom, apartment with air con (hot & cold), shared pools and beautiful gardens, within secure complex in idyllic setting. . Large, sunny, west-facing terrace with breathtaking views, perfect for al fresco dining. 2 mins walk from a beautiful cove and sandy beach. 5 min walk to 2 fantastic restaurants, a lovely tapas bar & a super local shop selling fresh bread and cakes etc. This amazing location is perfect for families, couples or golfers. 10-15 minute walk or 2 mins drive to the busier resort with its numerous restaurants, supermarkets, shops, bars, and 3 large beaches. The complex is gated, with communal gardens, a pool with separated children’s pool, loungers & parasols, & an allocated parking space. Non-smoking. No pets. The apartment is less than half an hour from the airport, and is perfectly situated to explore this beautiful island. To avoid confusion, the photo shows the beach which is less than 5 minute walk. Our apartment does not overlook the beach and does not have a sea view. Apartment Info: Spacious, sunny, west-facing terrace with lovely view of pools and forested hills in distance (accessed off the living area via lockable doors) has dining furniture for 4 & 2 loungers. Beautiful shared gardens, an adult and separate children's pool, with loungers & parasols. Pools maintained daily. Shower and toilet facilities adjoin the pools. Allocated parking space. Walk 3 minutes round the corner to beautiful small, shingly cove. 5 min walk to sandy beach,, loungers, shades & beach kiosk, pine trees - across road from a lovely cafe terrace.. 10 min walk/2 min drive to 3 larger sandy beaches of Peguera. 5 mins drive to beach and restaurant on the jetty at Camp De Mar. 15 mins stroll through forest to small secluded stony cove of Cala d'es Monjo. 10 mins drive to upmarket yachting resorts Port d'Andratx & Puerto Portals. Most beaches Blue Flag. The apartment is in a pretty village.. This is a beautiful, peaceful area, yet with everything you need close at hand. Restaurants, a tapas bar, a shop, and the beach are all just a 5 minute walk from our lovely apartment. This location is truly perfect, particularly for families with children, hence our decision to buy here! As well as the beautiful beach and pool, there are many activities in the area, from walking, swimming, water sports, cylcing, golfing, tennis, water parks, marinas, to exploring the magnificent city of Palma, just a 15-20 minute drive. The island of Mallorca really does provide 'something for everyone'. The areas is perfectly located for walking, cycling (hire available in Peguera), snorkelling, diving (lots of local clubs), sailing, water sports, golfing, or simply relaxing and enjoying the beautiful surroundings, restaurants and boutiques! With hot & cold air conditioning, this apartment is perfect for year-round holidays. Travel: Although not essential, a car is recommended if you wish to venture further afield - we usually use car jet. Frequent and numerous buses run from Peguera east to Santa Ponsa, Palma Nova and Palma and west to Camp De Mar, Port Andratx. Bus stop c. 10 min walk. Bathroom 1 (en suite to Bedroom 1) is fully travertine-tiled with a bath and shower, toilet and wash hand basin. It also has the benefit of a heated towel rail. Bathroom 2 (adjacent to Bedroom 2) is fully tiled with a large, powerful, walk-in shower, toilet and wash hand basin. It also has a heated towel rail. This is our Mallorquian home, which we hope to welcome you to. After buying a luxury apartment in probably the best area on the island, we have made every effort to ensure that you will have everything you could possibly need to enable you to quickly relax on your holiday. The main living, dining and kitchen areas of the apartment are open-plan, giving a feeling of space. The kitchen has brand new appliances (mainly Bosch), including oven & hob, washing machine, tumble dryer, dishwasher, tumble full size fridge & full size freezer, kettle, toaster, coffee maker, microwave etc. The living area has satellite TV (British & German), & DVD player, and a CD player. We have a range of accessories which we hope will make your holiday easy, eg provision of washing machine tablets, dishwasher tablets, a wide range of DVDs, including many children's DVD's for all ages, and CDs. All linen and towels supplied, except beach towels. Guide books and maps. Basic welcome grocery pack included. Walk across road to beautiful small, shingling cove. 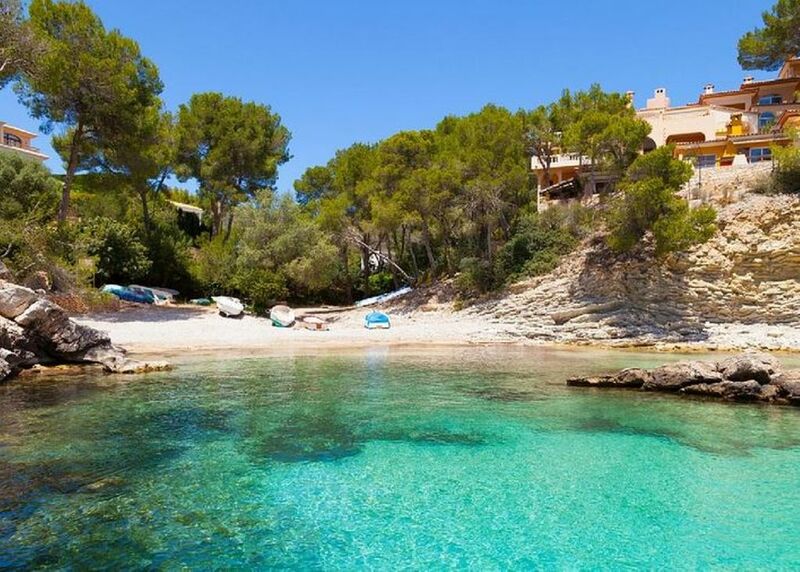 2 min further walk to beautiful small beach of Cala Fornells, with loungers, shades & beach kiosk, surrounded by pine trees & overlooked by 2 lovely cafe terraces. 5 min walk to 3 fantastic restaurants with amazing views, and our super village shop. 10 min walk/2 min drive to busier resort of Peguera, with 3 large beaches. 5 mins drive to super beach and restaurant on the jetty at Camp De Mar. 10 mins drive to upmarket yachting resorts Port d'Andratx & Puerto Portals. Most beaches Blue Flag. 20 min drive to historical old town of Palma, packed with charm & character, not to mention boutiques & tapas bars! Our apartment is perfectly located, to explore this beautiful island, with its beautiful coves & beaches, championship golf courses, traditional Mallorquin villages, rugged mountains, trendy boutiques & top rated restaurants, water parks. Less than half hour drive from airport, easy route, directions given.